home improvement dreams turn into reality. Most homeowners will go as far as asking their friends, associates and neighbors for referrals and typically go no further. The truth of the matter is that you should still pre-screen that contractor before asking him for a bid and also seek out another couple of bids to compare and contrast with that one. That’s how you find a good contractor. You get a few bids and you compare and contrast them at the end of the process and pick and choose the best looking bid given your hiring criteria. remember that nothing beats good old fashioned referrals from real people who have actually worked with the contractors in the past. Luckily you can also grab the names of some potential contractors from the web these days by using sites like Google. By doing a search for the specific trade you’re looking for and your city, you’ll see results for local contractors and you’ll probably also see some reviews and feedback from past clients as well to help you vet potential contarctors. Now that you have a list of potential contractors you’ll want to start vetting the contractors to separate the wheat from the chaff. and testimonials from past customers. All of these things should be considered when making a hiring decision. It’s also a good idea to utilize the internet to search for complaints and feedback for the contractors you’re still considering. If you’re having trouble whittling your list down to size, you may also want to call your local licensing bureau and ask if any complaints have been filed for the contractors you’re considering hiring. 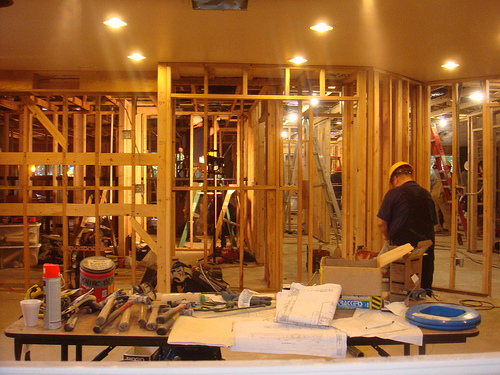 You may or may not want to conduct phone interviews before deciding which contractors you want to bid on your project. When you meet the contractor for bids, make sure to ask them for references from past clients that you might be able to contact. If your project is large enough, there’s nothing wrong with asking the contractor to arrange meetings with past or current clients so you can see the quality of the contractors work up close. The key to finding a good home improvement contractor is investigating all the details like making sure their license number and insurance details are current and up to date and checking past references to get the low-down on how it is to work with a particular contractor. By doing all of the above, choosing the right contractor becomes a matter of choosing the best bid that most suits your needs.